Get your pups off to the right start! Puppies aged 8-16 weeks and their families are welcome to join this energetic class packed full of useful tips in raising little Fido. Early socialization, beginning “come when called,” potty training, how to choose a dog food and puppy manners are all part of this class. 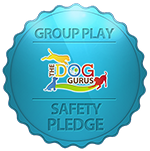 The only class in the area that is conducted entirely off leash so the pup learns off leash skills at a very young age all while interacting with other pups and people in class. This class is taught by the most experienced puppy instructor in the area, with over 18 years of teaching puppies. This a family friendly class, so bring the whole crew! Crucial lessons are learned within the first months – don’t miss the opportunity! If this class says "SOLD OUT," you can email us here to get on our class waiting list. Please note the desired class name, time, and start date in your email. If any spots open up we will notify you.